SAN FRANCISCO (KGO) -- To celebrate its 40th anniversary, "Good Morning America" is broadcasting nonstop for 40 consecutive hours in an on-air and live streamed event featuring celebrity performances, special events and the reunion of the morning show's previous anchors David Hartman, Charlie Gibson, Sam Champion and Joan Lunden, among others. The "40 for 40" event started Tuesday, Nov. 17 at 2 p.m. and will run uninterrupted into Thursday morning. Our very own Spencer Christian joined David Hartman, Joan Lunden, and Charlie Gibson on GMA Wednesday, from 10 to 11:30 a.m. From 12 to 1 p.m., Spencer he also did a "the weather hour" with Sam Champion and talked about their most dangerous, exciting, memorable, and enjoyable assignments. 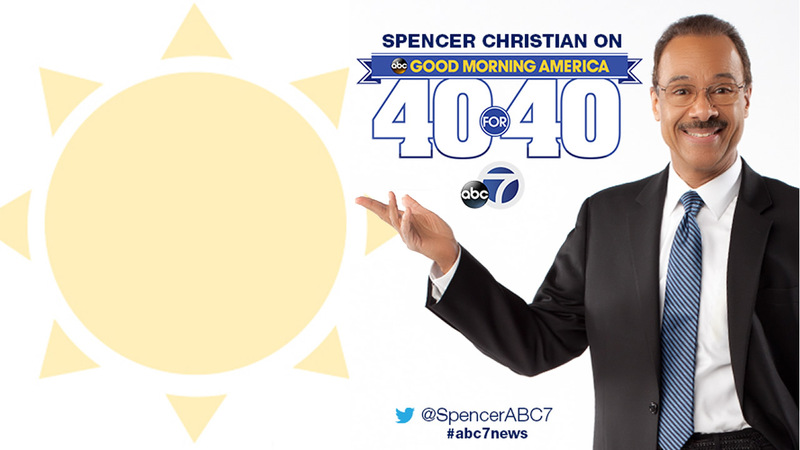 Spencer will be back on "Good Morning America" on Thursday morning during their live broadcast. GMA's "40 for 40" broadcast is being streamed live here, on WATCH ABC, on the Live Well Network (check local listings for channel), and on ABCNews.com/GMA40, where you can also find more content celebrating 40 years of Good Morning America and special moments from GMA's 40 for 40 event. During the marathon event, the band One Direction performed several songs from their new album, "Made in the A.M," including the new hit song, "Perfect," for the first time in the U.S. Jennifer Lawrence, Liam Hemsworth and other members of the cast of "The Hunger Games: Mockingjay Part 2," will appear live. Viewers will also see live rehearsals from "Dancing With the Stars" as competitors prepare for the season's finale, as well as a live stream from the red carpet of the premiere of the Netflix original series "Marvel's Jessica Jones." Mark Cuban, Daymond John and Kevin O'Leary, stars of ABC's hit show "Shark Tank," will join the event for a special edition of "Ask the Sharks" where they will answer viewer questions, and "GMA" contributor Tory Johnson will present the biggest "GMA" Deals and Steals ever - offering 40 products under $40. The event will end on Nov. 19 with the reunion of anchors. In addition to Champion, Hartman and Lunden, the former anchors and on-air faces will appear next to current co-anchors Robin Roberts, George Stephanopoulos, Amy Robach, Lara Spencer and Ginger Zee. Among those who will appear on the show are Nancy Dussault, Sandy Hill, Joan Lunden,Charlie Gibson, Kevin Newman, Lisa McRee, Diane Sawyer, Steve Bell, Kathleen Sullivan, Mike Schneider, Morton Dean, Antonio Mora, Josh Elliott, Dr. Tim Johnson, Dr. Nancy Snyderman, John Coleman and Mike Barz.